After five days of uncertainty and speculation, Britons on Tuesday finally got their new Prime Minister, David Cameron, and their new government, an unlikely coalition between Cameron's Conservatives and Nick Clegg's Liberal Democrats. Ever since Britain's May 6 general election failed to deliver a clear winner, the Conservatives and Gordon Brown's Labour Party had been in separate negotiations with the Lib Dems in an attempt to woo Clegg into forming a coalition. For days, it seemed like nothing was happening. Then, on Tuesday, it all happened so quickly. A day earlier, Brown  whose approval rating has been spiraling downward in recent months  had agreed to step down as Labour leader in the hopes of making his party a more tempting partner for the Lib Dems. As the Liberal Democrats met for the second time with Labour, many assumed it meant Brown's sacrifice had worked. But they were wrong. By Tuesday evening, Brown was packing his suitcases to leave 10 Downing Street. As the constitution requires, he visited Buckingham Palace to inform the Queen of his decision to step down as Prime Minister and advise her to invite Cameron to form the next government in coalition with those same Liberal Democrats. Then, as dusk settled, Cameron took the short drive up the Mall to do just that. The change of administration came at the end of another day of frantic horse-trading and political maneuvering. The first sign that Brown's hopes of salvaging a government from the defeat of the general election were about to be dashed came early Tuesday, when former Labour ministers talked loudly and publicly about what a mistake a LabourLiberal Democrat coalition would be. "It would be a disaster  a suicide pact for both the Labour and Liberal Democrats," said senior Labour MP Stephen Pound. "I don't care about the Libs, but I care desperately about Labour." That undisguised animosity toward the Lib Dems is familiar to many Labour MPs. Much of it dates to 1981, when four leading Labour MPs quit the party in protest of its leftward leanings to create the Social Democratic Party, which later merged with the old Liberal Party to form the current Liberal Democrats. But much of the dislike also comes from years of often bitter battles between Labour and Liberal Democratic candidates in local and national elections and the history of previous unsuccessful partnerships between them in the 1970s. Despite all this, there were suggestions that a deal was on. But gradually rumblings started to grow around Westminster that the LabourLib Dem talks, which had been going on since 10 a.m., were running into trouble. Plans for fresh talks between the third party and the Conservatives were back on. Negotiations continued for a few more hours. Then, when the end came, it came quickly. By mid-afternoon, Labour conceded defeat. A couple of hours later, Brown left Downing Street and, it is widely believed, British politics. Very shortly after that, Cameron walked through that famous front door for the first time to become the first Conservative Prime Minister in 13 years and the first to head a coalition government since World War II. Just what concessions Liberal Democratic leader Clegg has won from Cameron, particularly on the central issue of dropping Britain's first-past-the-post voting system in favor of a form of proportional representation (which would benefit his party), is still a matter of speculation. He certainly won himself the job as Deputy Prime Minister and up to five Cabinet posts for his MPs, although the Tories' George Osborne becomes Britain's new Chancellor and William Hague becomes Foreign Secretary. It also appears that Cameron is set to adopt Liberal Democratic policies on lower taxes for those earning less than £10,000 (about $15,000) annually and agree to four-year fixed-term Parliaments. So after five days of waiting for their new government to form, Britons finally know who is leading them. 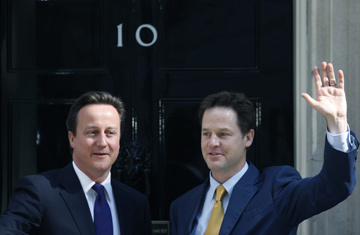 Now the question is: How will this coalition government work? And more important, will it work at all?